Apparently the 1990s saw a number of re-tellings of classic literature. Dangerous Liaisons became Cruel Intentions, The Taming of the Shrew was turned into 10 Things I Hate About You, and Richard III was moved to 1930s Britain. But it wasn't just long-dead male authors who were subjected to this treatment. Clueless is cute, no denying that. And intentional or not, it shows its age a lot. (And the final third is kinda creepy.) At least it's funny enough to make it passable (even if it is grating in spots). Wall Street. The Wolf of Wall Street. The Big Short. These three films have one similarity: they're all male-led films about the business world. Of course despite their quality, their sense of having well-written female characters is basically nonexistent. After all, there are women that work in this field. Thankfully Meera Menon rectifies that with her film Equity. Gone are the women who play only a meager role in fiction of this nature. Menon ensures that they're as third-dimensional and diverse as what Oliver Stone, Martin Scorsese and Adam McKay had with their respective films. 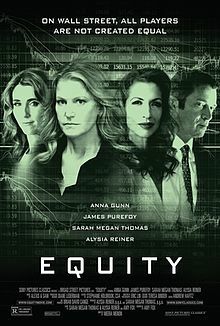 Leading the pack in Equity is Anna Gunn, best known recently for Breaking Bad. Like she did with her Emmy-winning performance, she provides an intensity within a dog-eat-dog world. It's survival of the fittest on Wall Street, and every day claims a new victim. Speaking of which, Equity continues the tradition of depicting the business world as cutthroat and merciless. It's the kind of environment where ingenious thinking at a fast pace is very crucial. In a way, the film borrows several tropes from various noirs and turns them on their head. Equity is one of several titles that shows women aren't afraid to tackle meatier subjects. (Who says they're only interested in the light and fluffy stuff?) Between this and Breaking Bad, Gunn should be a more in-demand actress. Hopefully that'll shortly change. When thrown into a new location, we don't know what to expect. Our comfort zone has been taken away from us, leaving us to fend for ourselves. But sometimes such a change could be a good thing. But what if it doesn't work? What if the trouble you tried to run away from keeps following you like a bad smell? Indeed that seems to be the fate of some people but sometimes it can result in their undoing. 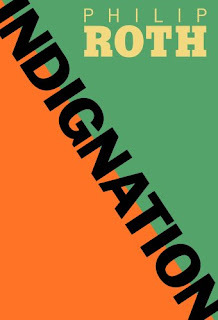 Philip Roth's novel Indignation chronicles a young man's attempt to survive far away from his father's constant worrying. What he encounters at his Ohio college is sexual discovery, repression and the looming fear of the ongoing Korean War. And he also unveils the damaged psyches of some of his peers. 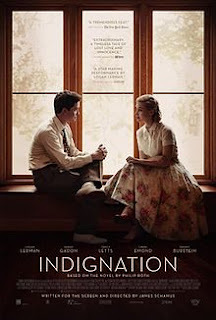 Both Roth's novel and Schamus' film portray a less than idyllic era only the more bold of media will capture. There are a few differences between the two works, yes, though that's not the critical aspect of them. What stands out from them is how flawed and imperfect we as a species are. David Swift's How to Succeed in Business Without Really Trying takes on a more amusing tone in hindsight of Mad Men. Not strictly because it involves the advertising business in the 1960s but because both works feature a similar name: Robert Morse. A whole four decades before Mad Men re-introduced him to mass audiences, Morse's big break came in the form of How to Succeed in Business Without Really Trying. And his J. Pierpont Finch has more than a few similarities with Don Draper. That aside, Finch and Draper are of different temperaments. Draper indulges in numerous vices while Finch is noticeably more virtuous in nature. And Finch's environment relies more on backstabbing whereas Draper's focuses more on competence (which is a tall order what with all the drinking and sleeping around). 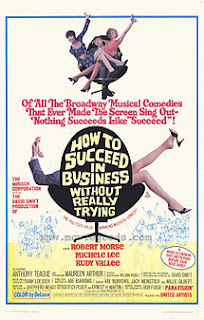 Anyway, How to Succeed in Business Without Really Trying certainly captures the era it's both from and set in. But it's because of that aspect the film hasn't aged well. Still, seeing this then a particular scene from Mad Men's final season makes for an amusing combination. There's something about actors that hail from New York City that have that extra oomph for their performances. Barbara Stanwyck, Humphrey Bogart, Lauren Bacall, Tony Curtis...something about their street smarts adds to their acting. And boy, that was all the more prevalent during the pre-Code era. Roy Del Ruth's Blonder Crazy stars two such names: James Cagney and Joan Blondell. Throughout both their careers they played characters who follow their own rules and don't take guff from anyone. And since they play con artists here, it takes another step further. As proven by later films Taxi! and Lady Killer, Del Ruth got an energetic turn out of Cagney. (Then again, most if not all of the pre-Code films he starred in can be applied to this scenario.) He delivers his lines at a mile a minute, a frequent expectation of stars during this era. And like countless later titles of his, Cagney commands the screen. 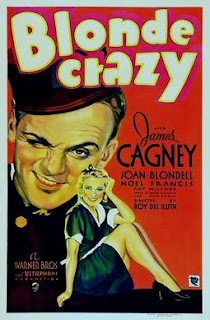 Blonde Crazy may not be the best of Cagney's pre-Codes but it's certainly one of the more entertaining. It's because of his rapport with Blondell that makes it so. It also serves as a nice temporary escape. Okay, I'm gonna keep this post short, sweet and to the point. 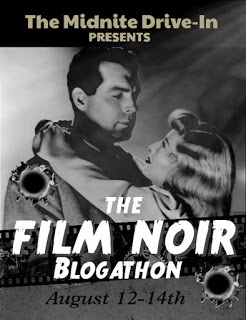 Quiggy over at The Midnite Drive-In is hosting a blogathon where the main theme is, well, film noirs. My pick? There are those famous for good things and those famous for bad things. And then there are those whose claim to fame is being so terrible at what they do, it almost becomes good. It's a narrow field to begin with but such people exist. Stephen Frears' Florence Foster Jenkins focuses on one such person. Its subject is the titular socialite (Meryl Streep) who has a deep passion for singing. The only problem is that she can't carry a tune if her life depended on it. That doesn't stop her from pursuing her dreams. As Frears has previously done with the likes of My Beautiful Laundrette and Dangerous Liaisons, Florence Foster Jenkins shows there's more to the characters than they initially let on. It's made clear early on that Florence has her eccentricities (apparently a common trait amongst the wealthy, both real and fictional) but she's just like the rest of us: searching for that true calling in life. But Florence Foster Jenkins isn't just Streep's show. 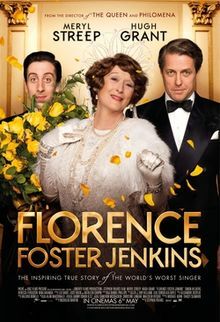 Also in the film are Hugh Grant (at his best since perhaps About A Boy) and Simon Helberg (who steals the show during Florence's first singing lesson). Though the film is about her, it focuses more on those two men in her life. Regardless of that detail, Florence Foster Jenkins is still enjoyable in a heartbreaking sense. Much like Ed Wood, what's initially perceived as a comedy is more of a depiction of someone who yearns for their moment in the spotlight despite not enough know-how to get and stay there. In other words, Frears' film is more tragic than comic. 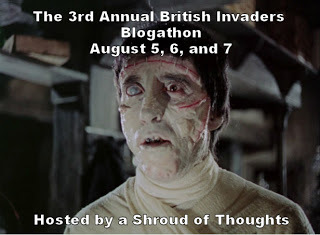 Terrence over at A Shroud of Thoughts has brought back his British Invaders Blogathon for a third year. Last year, I wrote about four films with a similar theme. This year I stuck with one title. Which one, you ask? "Who on earth is that ravishing boy?" This question escapes Lytton Strachey's (Jonathan Pryce) lips upon first laying eyes on Dora Carrington (Emma Thompson). (He's quickly disappointed.) Carrington (which she prefers to be referred as) herself laments about being a woman. 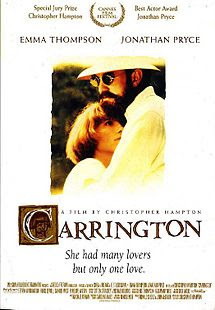 What follows in Christopher Hampton's Carrington is a true story of deep devotion. While Strachey's work was known during his lifetime, Carrington -- much like Vincent van Gogh before her -- became prominent in the years after her death. But their success isn't the whole point of the film. What mattered more to them was the other's well-being. Also shown throughout Carrington are the sexual politics of the time. Both Strachey and Carrington were members of the Bloomsbury Group (it's briefly alluded to at the beginning of the film), which rejected the social norms of the Victorian era. They were part of a group that influenced the rest of society. Carrington focuses on two forgotten names of British culture, and Hampton has them come alive again decades after their deaths. The performances from Thompson and Pryce show the dynamic between this odd couple and how their lives became interwoven. It's a bond that stays united in this life and the next. "The most mysterious mysteries are people, and usually people who don't seem mysterious at all." So opens Mitchell Leisen's To Each His Own. It's a story of a woman who tries to escape her past indiscretion but has it gnawing away at her for years. 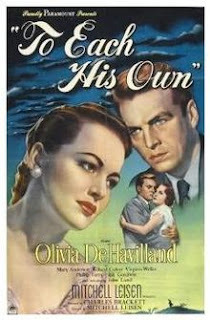 The woman in question is Jody Norris, played in top tier form by Olivia de Havilland. Bear in mind that To Each His Own was made following the legal woes de Havilland faced with Warner Bros. and the contract she was under with them. After two years of not working, she signed on to this film. As she would do in her later performances like The Snake Pit and The Heiress, de Havilland shows how layered a character Jody is. When we first see her, she's a bitter middle-aged woman and through flashbacks we see what made her jaded and broken. To Each His Own is a heartbreaking piece of filmmaking. In anyone else's hands, Charles Brackett's script could've turned into an overwrought melodrama reminiscent of Douglas Sirk's films the following decade. But thanks to Leisen and de Havilland, that is far from the case. 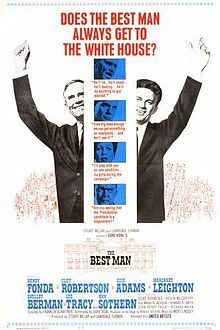 Franklin J. Schaffner's The Best Man has its opening credits superimposed on images of all the United States Presidents up until the then-current one in office. (Being a film penned by Gore Vidal, it was probably his idea.) What ensues in Schaffner's sophomoric film shows that very little has changed since its 1964 release. It's unsettling how much The Best Man parallels the present election. So much focus on the mudslinging between the candidates and not enough on their policies. Hopefully Vidal's not currently turning in his grave. Anyway, to think this all started out of sheer boredom on this day seven years ago. I've met some really nice people because of my writing (and through Twitter), and I hope this will continue as more time wears on.